After being exposed, scammer bank Stanbic has promptly paid out an insurance claim to a client it was trying to dupe. A few weeks ago, the Watchdog published an article where Stanbic was refusing to pay a client who had a life insurance policy for his late father. From 2009, Stanbic deducted money from the client for his and his parents’ life polices from his account. But when his father died, Stanbic refused to pay claiming that the bank stopped deductions because their system developed a faulty. The bank had made deductions for six years. For more than three months, Stanbic continued playing monkey tricks with the loyal client until the bank was exposed on ZWD. A day after the article appeared on ZWD, Stanbic phoned the client and paid him without any more questions. “Thank you Watchdog for helping, the bank phoned me, paid and apologised, the client told the Watchdog. See the original letter below. Stanbic is notorious for scamming Zambian clients and grabbing property from clients who borrow money and experience some challenges in repaying, even after paying the principal amount, the bank grabs everything from the client. There are many Zambians who have suffered at the hands of Stanbic but three profile cases stand out. Stanbic grabbed farms and equipment from one of Zambia’s previously admired farmers Costain Chilala reducing him to a pauper. We understand Chilala is now depressed, thanks to Stanbic, the bank of the year. Just last week, Stanbic brought down Miyanda katiwa, an enterprising female farmer by grabbing her farm, green house and other properties, this despite having paid most of the money. Katiwa was enticed and duped through the so-called Anakdzi project. In fact, the Anakadzi project itself is a stolen idea and marred in intellectual property controversy. (Details will follow). 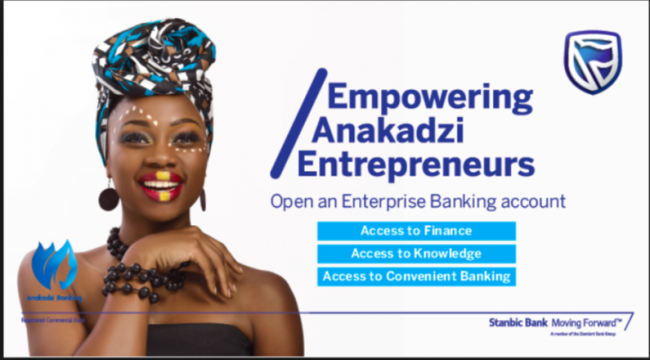 Another Zambian business icon Stanbic has been trying mess up is Clever Mpoha, the owner of Savenda Management Services. Apart from maliciously reporting him to the Credit Reference Bureau so that he does not access financing from other banks, Stanbic is holding on to two securities for Mr Mpoha relating to other loans which he has paid in full. But the bank is simply holding on to title deeds which were provided as security. In one case, sources within Stanbic explain that Mr Mpoha obtained a personal loan for K747, 000 to be paid over a period of 10 years. The loan was for building a house. When he had paid about K252, 000, Stanbic decided to recall the loan and demand that he pays all the remaining amount immediately. According to bank insiders, the Bank decided to recall the loan as punishment as at the same time Savenda was taken to arbitration. ‘How do you relate personal loan with company loan at the same time? This is why as employees we are worried that this bank will one day will find doors closed because the number of dissatisfied clients is increasing,’ one employee complained. Kindly publish this for me on your platform, may be somebody from BOZ will read. In 2009, I agreed a life insurance policy with Stanbic bank where I insured my dad, mum and myself. So Stambic bank had put a standing order on my account and deductions were being done. Three months ago my dad passed on and after the funeral i went to file a claim at the bank’s branch in Chipata. They told me that their system didn’t show that i had a policy with them, to my surprise. I wrote a letter to the bank and their head office called me. The bank told me that they changed their system and so the deductions stopped after 6 years of deductions. I asked them if at all they communicated to me or I wrote them a letter to stop and they said it was their system that was at fault. So they told me that they did not deduct k1400 which was the cumulative figure from the time they changed their system. I told the bank to deduct the 1400 from my account to recover the months that they did not deduct, secondly I told them to put the standing order back and thirdly we agreed that i file in the claim forms so that they can pay me according to the policy. It has been three months now and the bank has been acting crooked. They have not done any of the things we agreed up to date. I have made several trips to their branch in Chipata and calls to their HQ nothing has been done to date. This was supposed to be funeral relief but i have spent already a lot on fuel to Chipata and the purpose of insurance therefore is even defeated. Many Zambians have bad experiences with insurance companies so i thought dealing with a bank will be a different experience but i get a shocker as well. As many banks are now into insurance, let the Bank of Zambia come in and protect us from these Banks who want to take advantage of the masses through insurance which they take time to pay. The bank staff even lie that they will follow up the issue and call back and they never do. It’s like you are a burden to them. If the bank cant just pay a small amounts like a funeral policy how about huge claims? ?